From the Eurovision Song Contest 2013. IM Radlovacki(SRB) took clear first with 7/9. White is suffering from a bad pawn structure and having the worse minor piece. What do you recommend for black? Haitbaev,Hayrulla(TKM) and Farkas,Richard(HUN) shared first with 7/9 in First Saturday FM-A. Here is one of Haitbaev’s wins. Black has the bishop pair and an usual pawn structure. What do you recommend for black? 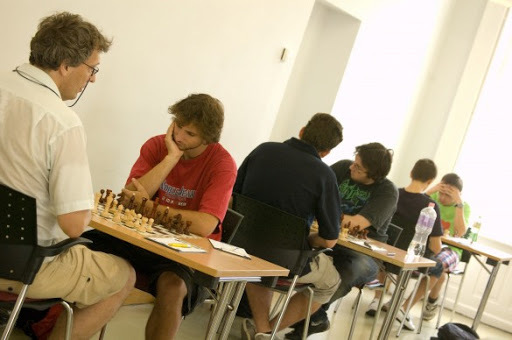 GM Berczes and IM Atabayev(TKM) shared first with 9/12. Farkas(HUN) and Haitbaev(TKM) shared first with 7/11. Lukacs(HUN) and Marcu(SVK) shared first with 7/10. There will be a nice Open with corresponding GM RR and IM RR at the same site in the heart of downtown Budapest. Here is Berczes’s rd2 game. White has a massive attack going but must first answer the threat to Be3. What do you recommend for white? Eight players from Turkmenistan are playing this month. Promising junior Krstulovic(age 9) returns to action this month. Also playing are two players from Turkmenistan-Amangeldiyev and Haitbaev. Farkas also returns to resume his drive towards 2200. Marcu(SVK) is back in Budapest again.